Sometimes your relationship with your home can be similar to a marriage. After years with the same person, we might start taking them for granted. And just as it’s important to go on an occasional “date” and do things to keep the spark alive with your spouse, the same goes for your house. Don’t feel stuck with the same old paint and appliances you picked out 15 years ago, or make do with the floor plan you originally fell for. Right now is a great time to remodel, and the experts at Ron Williams Building Company will help you get the home of your dreams – again with some great ideas for remodeling in Winston-Salem. Why not take advantage of all that space in your yard? Whether it’s adding on a simple deck or creating an outdoor kitchen, outdoor living is a great new trend. It makes for a fun place to entertain friends and hang out with your family. And with the great weather we have here in the Triad, you can make use of your new space almost year round. The experts at Ron Williams Building Company are here to help! Ideas: Keep it simple with a wood deck and a chiminea for the most return on your investment, or go all out with a beautifully landscaped living area and full outdoor kitchen to create your dream entertainment area. Just like adding on a deck, remodeling your kitchen is another home improvement project that is guaranteed to add value to your home. Take a good look at what you have, and then make plans based on how you want to use your kitchen with help from Ron Williams Building Company. Ideas: You can simply refinish your existing cabinets for a fresh new look. Replace those old countertops with a new surface such as wood, tile or stained concrete. 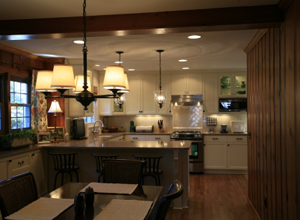 Or go all out and add an island workstation and new appliances for a fun new family area. It’s amazing how much a change in fixtures and some fresh tile can change a bathroom from boring to spa-worthy. Ideas: Replace that all-in-one shower with some nice tile for a step up, or bring in a new vanity equipped with a marble countertop for a classy look. Contact us for an estimate or to learn more!